“Firewall” — When a psychologist’s number comes up, Reese (Jim Caviezel) must protect her from one of her patients while eluding capture by the FBI, who are closing in fast. 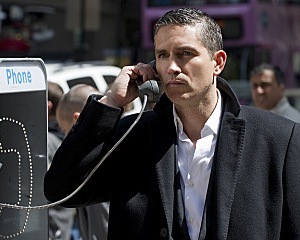 Meanwhile, Finch receives an unwelcome visit from an old acquaintance, on the first season finale of PERSON OF INTEREST, Thursday, May 17 (9:00 – 10:00 PM, ET/PT) on the CBS Television Network. Photo: John Paul Filo/CBS √?¬©2012 CBS Broadcasting Inc. All Rights Reserved.